A modern and comfortable villa situated in a secluded and peaceful area of La Mola, with spectacular views overlooking the entire south coast of Formentera - Migjorn beach. The villa would suit small groups or families. Bedroom 1) Double bedroom with 180 cm wide bed. Sleeps 2 people. Bedroom 3) Double bedroom with 130 cm wide bed. Sleeps 2 people. Bedroom 5) Double bedroom with 150 cm wide bed. Sleeps 2 people. The villa sleeps a maximum of 9 people and it is not possible to add extra beds. There is a large open plan living room with dining room, and chill out area with TV and sofas. WIFI, DVD player, bluetooth stereo system. The exterior has large terraces and wooden decking with chill out and dining areas. Views to the garden, beautiful countryside and coast of Migjorn beach and across to Ibiza. Guests can enjoy an easy walk to the splendid coastline of Cala des Mort and Bartolo's authentic kiosko. 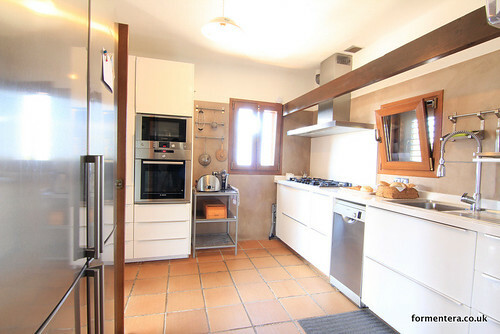 We highly recommend this unique and splendid villa as a place to spend your Formentera holiday. Gas barbecue is available for guests to use.